The holidays are a time when LDC, Inc. focuses on giving both to the community and to its employees. During the months of November and December, we hold our annual toy drive and our company-wide Christmas party. Throughout the month of November, LDC, Inc. partners with the NW Wireless Association to hold a toy drive for kids who would otherwise go without a Christmas experience. 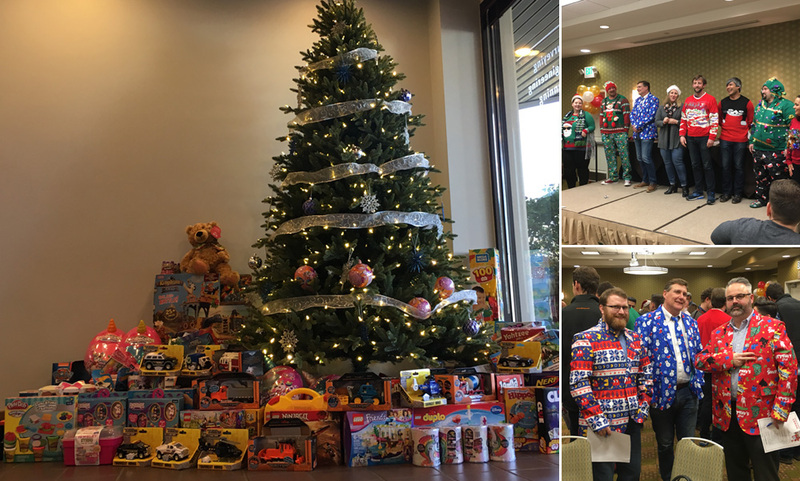 LDC, Inc. participates in the NW Wireless Association Christmas party with a sponsorship as well as hosting our own company donation to be delivered to Toys for Tots. 2018 marks the fourth year that we have participated in this program. As each November comes and goes, LDC Inc. employees and their families consistently donate more toys than the previous year. This year was no exception – 160 toys were generously donated. It is a great reminder to embrace gratitude and to see the spirit of giving exemplified by so many. LDC Inc.’s Annual All-Staff Christmas Party is a carefully planned and exciting event that everyone at the company looks forward to in the month of December. Our owners plan this event as an opportunity to celebrate employees as we look back at our past successes while looking forward to the New Year ahead. This year’s Christmas Celebration took place in a beautifully decorated venue and featured a delicious holiday buffet, a popular MC, fun games that everyone got to participate in, and generous prizes. There was even an ugly attire contest that many participated in. It was great comradery to see everyone having fun outside of the office. It is times like these that remind us that we are thankful for being a part of such an amazing company. Cheers to a successful and amazing 2018. We look forward to a happy and successful 2019!